Molly Wizenberg is the creator and writer of the blog, Orangette. She is also a cultural anthropologist with deep kitchen experience. The combination is in itself, a delicious recipe. Wizenberg is a storyteller and her stories are most often personal histories punctuated with tongue warming dishes that are woven in as intricate details. What I most appreciated from her writing is her own admission that recipes on their own are quite boring but it is the context, the human event and the history that we set the recipe inside which creates a worthwhile tale. Such is the case of this book. Many chapters are tributes to her beloved father, Burg and then from her blog emerges a romance wrapped in shaved fennel, asian pears and parmesan. I received this lovely book from a regular reader, Heather. When I began reading, it seemed that most of the recipes were of the sweet and dessert variety. The timing was good since I had a 13 year old birthday to bake for and Molly’s Chocolate Cupcakes with Bittersweet Glaze disappeared from the serving platter faster than….. Since then, I’ve dog-eared many pages that I plan to come back to inside of my own kitchen and they are always her savory dishes such as Ed Fretwell Soup, Cream Braised Green Cabbage, and Carmelized Cauliflower with Salsa Verde. Even with Halloween behind us, Pumpkin Palooza goes on. Check out the modern heritage foodstead of the Auburn Meadows Farm and this hearty spicy pumpkin bean soup. Across the globe, Tes at Home provided an idea about stuffing the whole pumpkin with a Thai curry. This looks remarkably easy and I’m dying to try it. Could be featured on a Thanksgiving table soon? From Food Policy Action, Washington has been put on the menu. This group is developing a scorecard based on votes taken during the 112th Congress. The votes cover a range of issues from food safety, hunger, farm subsidies, food labeling, organic food and local food systems and lawmakers are rated on their food policy. Even coming out of an election, I think knowing where individuals stand will serve our needs better going forward. If you’re a coffee drinker as I am, then it’s quite likely that your early morning beans were harvested by women. NPR introduces us to four women who are working to change the nature of that harvest. Finally, get ready to party like it’s 1949 because technically with the expiration of the farm bill, we now revert to the policy drawn up that year. Many individuals and policy groups alike see the farm bill as priority one for a new Congress. Finally, here in my home, we’ve been busy with local festivals, farm to table dinners, and this weekend, the Tour de Coops (showing off neighborhood chickens). Stay tuned for photos and recipes and a blog facelift. Finished On the Road by Jack Kerouac!! Hate to admit that I haven’t read it or seen the film. Hang in there. You can write a fascinating post on that one! Pumpkin with Thai curry? Sounds FABulous! Your gingered carrot soup from years ago is a family favorite. The links are great and so diverse, a little bit of everything. Perhaps I’ll see you this Saturday at the Tour de Coups. Have a fun-filled weekend! I want to make this curry next week. I love the idea of sticking it all inside the pumpkin and then baking it! Glad you liked the pumpkin soup, I was just planing to make some more 🙂 . I was charmed in Molly’s book about her husbands vinegar & pickle addiction and their wedding pickles. I’ve made the pickled grapes and they are amazingly good. Great holiday gifts. I haven’t heard of that book before but I’m up for happy reads. Yes, making wedding pickles was really a fun idea. I’m looking forward to seeing photos of chickens. The girls who lay eggs for our farm share hang out in an RV. It’s the coolest chickenmobile I’ve ever seen. in an RV? wow! I saw one coop yesterday that was my all time favorite. Will post soon. How to love food and lose weight!! For them a major challenge but good stuff, worth looking at. I can always use advice like that! That pumpkin bean soup sounds delicious! Now I know what’s for dinner tomorrow! I’m currently reading “Make the Bread, Buy the Butter” by Jennifer Reese and “Rediscover Catholicism” by Matthew Kelly. Hmmm. I would like to know more about the Make the Bread book. I have the same book too & Use it a lot! So tasty recipes in here! 🙂 I agree! What else have you made from the book Sophie? The coeur à la crème with raspberry puée, the coconut macarooms with chocolate on top, the cranberry chutney with cristallized ginger & dried cherries, caramelzed cauliflower with salsa verde, Scottish scones with lemon & ginger, pickled grapes with cinnamon & black pepper, etc! 🙂 A lovely & great tasty book! hmmm, like the word feast Nancy. May have to play with that for future posts. Hopefully it will be done in a week or so. Tammy, you are an excruciatingly good writer. This blog is a delight. Thank you for all the amazing links, for keeping us connected to good things , food and people. Loved the book review and am looking forward to whatever your next post brings! I am trying to find a rhythm Debbie; some good reading, some good advice. I like research based articles that make me think. I love culture and food and community and am trying to create “a brand” that says all of that. Off to check it out. Really loved the interview on your blog this last week Tandy. Molly is such a talented writer, with a sweet, amiable voice that really connects. Terrific recipes, too. I always enjoy your round-up of good food things. My weekend reads: finishing Carson McCuller’s The Heart is a Lonely Hunter. I haven’t read that book but it is on my “to read” list. I believe there is a movie also? Thanks for all the links and I even enjoy all the comments on your blog! It is really fun to see what everyone is reading, isn’t it Linda? How about you? What are you reading? Reading Straight Man. Love being in a book club–keeps me on task! Yes. I’d love to be in a club but don’t have the time now. Thanks for the post and the links. As for the Farm Bill, the one thing that concerns me about this administration (which I fully support) is their lack of push for the farmers. Yes, economically they are in a good place now, but here in the Heartland, we remember quite well how things were not so long ago. We need our farmers working hard and being successful because when they give up, we all starve. Without a strong farm sector, Hunger Games won’t just be a book or a movie, it will be reality. I think we need to elevate the issue of food security. It’s not even contemplated except perhaps in NY where people just experienced a real disruption. Excellent blog and I enjoy all the food for thought from your viewers. I used to make my boys a South American meal on Halloween that was a stuffed pumpkin with lots of cumin and garlic, corn and beans, several other veggies. I will try and find it for you as well. It was so so good. I love the thought and smells of all these great ideas presented. Pumpkin, particularily white is good for weight loss. It is what we add to it often that is not. I am reading “PLENTY” right now. Soon to be shared with my daughter in laws! Hmmm. That sounds great Sally and I look forward to learning more about “Plenty”. I just finished re-reading Counting My Chickens (and other home thoughts) by The Duchess of Devonshire, Deborah Cavendish. It’s a quaint little memoir, totally upper-crust British aristocracy, but it’s clear the Duchess dearly loved her chickens and the rural/ag life. I can’t imagine what it would be like to be part of the landed nobility, but she’s very down-to-earth and matter-of-face. It’s a fun read, too, if you’re a fan of Downton Abbey, because I could imagine Deborah growing up in that environment, post Great War changes and all that came with it. I first read it around 2002-ish and pulled it out again because I’d forgotten a lot of the details. Definitely worth revisiting. I look forward to checking out A Homemade Life. It sounds like the Duchess is a good story-teller which is in fact, what Molly is so good at too. I’ll look for it at the library. I loved reading her columns in Bon Appetit before they had an editorial change and dropped many of their writers in favor of new voices. She has such a nice way of telling a story. I love that she believes the food is only relevant with the story. I’m sure there are times when that isn’t the case but I’m going with it too. That is what makes blogging so pleasurable. Great stuff, Tammy. Mouth-watering, actually. I’ve been reading “The Longest Way Home,” a travel/relationship memoir, by Andrew McCarthy. It’s good. hmmm, I love memoir writing. May have to check it out. This is a great book that shares both delicious recipes and stories of life that we all can relate to. I will check it out. My wife will love this. 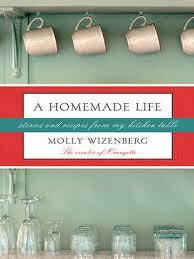 I have Molly Wizenberg’s book too, but I never made it past the first few stories/recipes because I would cry too much. She’s a great storyteller though. p.s. I love the new look of the blog!